Over the next few years, my magnets appeared in retail outlets such as Pottery Barn, Nordstrom, Disneyland, and Bloomingdales and on the refrigerators on the sets of television shows such as "Friends," "Seinfeld," "Home Improvement," and "Bay Watch." 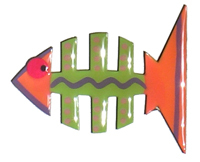 Due to the popularity of the magnets, I expanded the line to include other items such as key chains, jewelry and a children's bathtub toy - get the fish wet and they stuck to the side of the tub! It was wonderful while it lasted, though producing every one of the fish magnets (there was no other way) proved to be a bit much. Because the process of producing them was labor-intensive and therefore not cost-effective, I decided to finish up the orders I had, though not seek more. Instead, I decided to focus my energies on design and fine art.